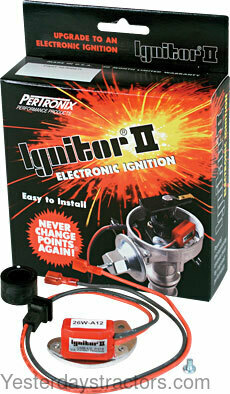 The Ignitor II has many of the same great features that the Ignitor has, but its smarter. It senses the coil current level and use a powerful micro controller to adjust variable dwell which helps to maintain peak energy throughout the entire RPM range. Senses startup and develops more energy for quicker, easier starting. Current protection shuts down the system, preventing component damage. NOTE: Ignitor II applications can not be used with solid core ignition wires, can be used with our ignition wires p/n S.66442. Replaces points and condenser with an electronic module. Use with 12 volt negative ground systems. For tractor models 930, 970 with A377G. New, aftermarket Electronic Ignition Conversion Kit, High Perfomance, 12 Volt Negative Ground for sale with a solid manufacturer warranty. In addition, we have a generous 30-day return policy if this Case Electronic Ignition Conversion Kit, High Perfomance, 12 Volt Negative Ground for Case 930, 970 tractors needs to be returned for any reason. Please see our Parts Warranty and Return Policy links on your left for complete details before returning.